Gronkowski is a fan-favorite and has been playing with the Patriots since 2010, winning two Super Bowl rings with the team in 2015 and 2017. He was diagnosed with a concussion during the AFC Championship game, but he was cleared to play in Super Bowl LII on Feb. 1, according to ESPN. The 28-year-old tight end has been in a relationship with former Patriots cheerleader and Sports Illustrated swimsuit model Camille Kostek for the past few years. The 25-year-old model first publicly acknowledged a relationship with the football player in 2015, but there have been rumors and speculation whether the relationship is currently still on — or if it's been called off. But recently, Kostek,is in Jacksonville, Florida, for Patriots game against the Jaguars. Kostek has been hanging out with some fans, tailgating before the game. Kostek has been posting photos and videos of her time on her Instagram story throughout the day. The blonde model appeared to be having a great time, as she mixed and mingled with fans from both teams. At one point, a younger fan showed Kostek her dance moves — something that Kostek really seemed to love. In another video, Kostek was hanging out with two Jacksonville fans. One of the girls looked at Kostek and called her a “queen,” clearly making Kostek’s day. Kostek traveled to Jacksonville, Florida, with the New England Patriots on Saturday. She posted on Instagram about being able to wear team sweats on the plane — which was a total win. After spending the night in the city (and posting on Instagram about trying to get on a party boat), Kostek showed up at TIAA Bank Field ready to pre-game. Wearing a pair of denim daisy duke shorts and a black and white Gronk jersey, Kostek has been living her best life ahead of 4:25 p.m. Eastern kick off. She posed for the following photo with a fan, showing off her toned legs and her Patriots pride. Kostek has been dating Gronkowski on and off for a couple of years now. The two seem to have rekindled their romance over the past several months, and things appear to be going really well. 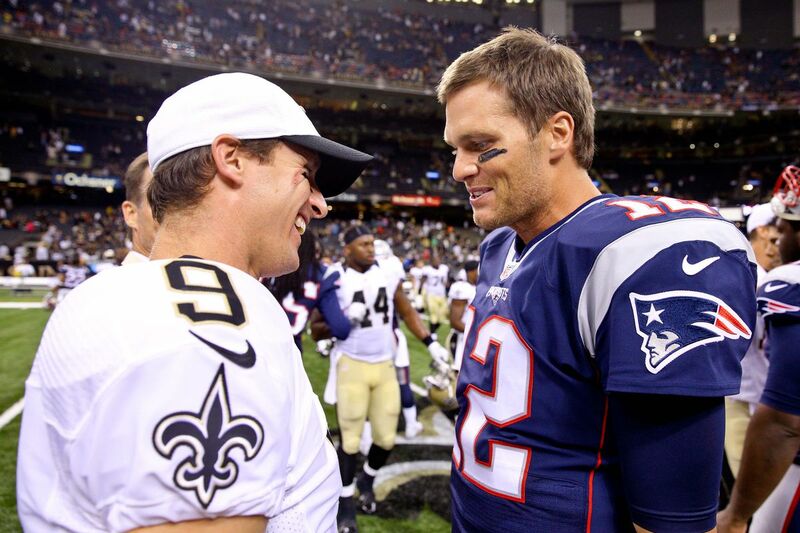 Drew Brees VS Tom Brady,Which One Is Better? Brady and Brees’ professional careers began only a year apart. Brady, a product of Michigan University, was drafted infamously late with the 199th pick in the 6th round of the 2000 NFL draft by the New England Patriots. You can watch him cry about it in this clip. Brees, a product of Big Ten rival Purdue, was drafted with the 32nd pick in the 2nd round of the 2001 NFL draft by the San Diego Chargers. Brady stands 6-foot-4 and 225-lbs, while Brees barely makes 6-foot and 209-lbs. Brady has played in 237 games over 18 seasons which averages to 13.2 games played per season. Aside from riding the bench as a rookie through the first game in 2001, 15 games in 2008 to an ACL tear, and 4 games in 2016 to league mandated suspension, Brady has played all 16 games of every season of his career. Brees has played in 233 games over 17 seasons which averages to 13.7 games played per season. Brees has played in all 16 games in 11 seasons, while playing in 15 another three. Both quarterbacks have been the picture of health, availability, and consistency over their respective tenures. Since joining the Saints in 2006, Brees has thrown for more yards than Brady in every season except two (2007, 2009), including passing for over 5,000 yards in 5 seasons compared to Brady’s one season hitting that elusive mark. Over their entire careers, Brees has passed for 4,529 more yards than Brady, while also averaging 23.9 more yards per game than the chin-dippled one. “Tom Brady is far less likely to suffer an injury that will keep him from performing at the 4,000- to 4,500-yard level he's been at. Drew Brees has a gunslinger mentality and depends on athleticism to play at a high level. Despite 5,000-plus yards being the standard for him, Brees is exposed to more hits that we don't see Brady take. To end Brady's career, you're going to have to end him physically, but it's so hard to get to him because he manipulates a four-by-four pocket better than anyone I've ever seen. Because of their different styles, Brees might have two or three years left, while Brady might have four to six. I'm going with Brady on this one.”said by Heath Evans from NFL.com. New England Patriots pass rusher, Trey Flowers, left early in the first quarter of their game against the Jaguars after taking a scary hit to the head in an accidental collision with teammate Keionta Davis.He walked off the field on his own and was evaluated for a concussion. The team ruled Flowers out for the rest of the game early in the second half. Flowers was drafted by the Patriots in the fourth round of the 2015 NFL Draft out of Arkansas. He essentially redshirted his rookie season, but has quickly evolved into one of the more impactful pass rushers for the Patriots. Last season, Flowers was able to total 6.5 sacks, 28 quarterback hits and 24 pressures. He's also led the team in sacks both in 2016 and 2017, while proving he can also come up in the clutch as evidence of his two and a half sacks in Super Bowl LI against the Falcons. Without Flowers rushing in from the edge, the Patriots struggled to generate much pressure on Jacksonville quarterback Blake Bortles. 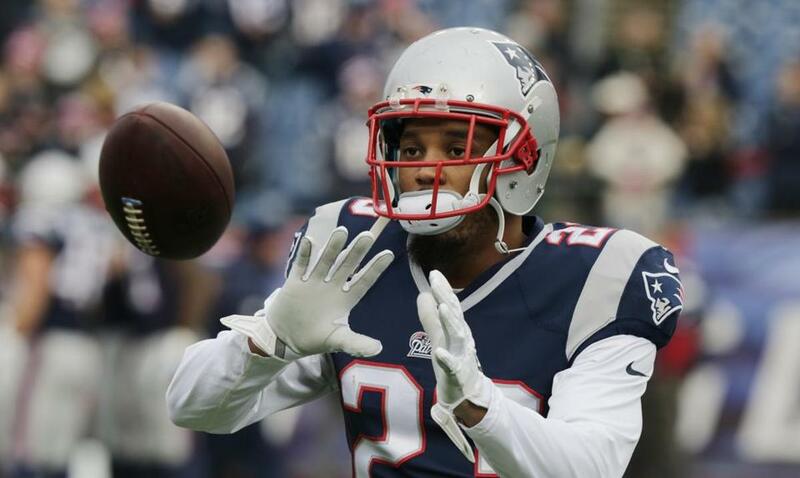 The Patriots also lost starting safety Patrick Chung to a concussion on Sunday. Meanwhile, Chung was in coverage on the Jaguars' final offensive play of the second quarter -- a 4-yard touchdown pass from Blake Bortles to tight end Austin Seferian-Jenkins -- when he was chasing Seferian-Jenkins to the left side of the end zone and made contact with receiver Dede Westbrook, who was running an inside-breaking route. It was unclear if that was the play on which Chung -- who was also serving as the team's primary punt returner in the game -- sustained a concussion. Veteran Duron Harmon took over Chung's duties on defense in the second half. 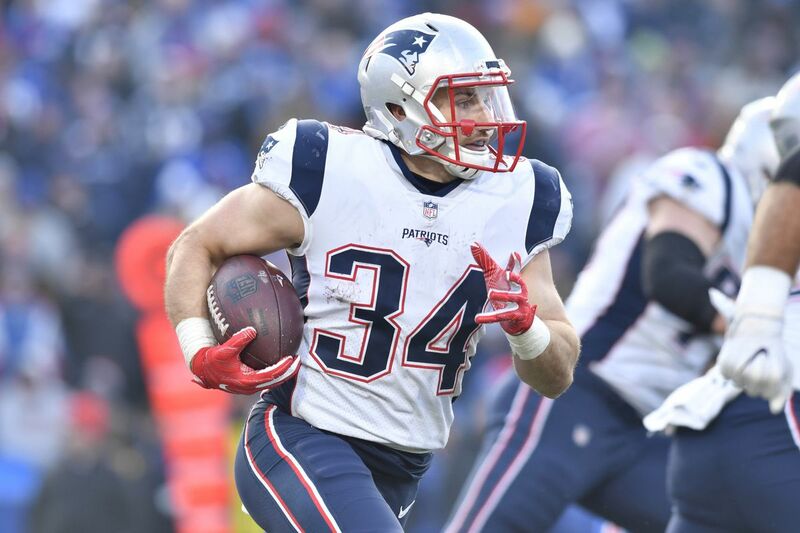 New England Patriots running back Rex Burkhead is in the concussion protocol and did not participate in practice Wednesday, putting his status for Sunday's road game against the Jacksonville Jaguars in question. Burkhead took a brutal shot to the helmet late in the second quarter in New England's win over the Texans. Kareem Jackson came from his spot at safety to lay a hit on Burkhead that forced a fumble with less than a minute left in the half. The Patriots recovered and eventually scored, but Burkhead remained sidelined for the remainder of the drive. He returned early in the third quarter, on the second Patriots drive of the second half. With Burkhead’s status unknown and with Jeremy Hill out for the year, a brighter spotlight shines on rookie Sony Michel. The first-round pick participated in a limited capacity on Wednesday, after he limited all of last week and was inactive for Sunday’s game due to a knee ailment.Michel told reporters on Wednesday that he's preparing as though he'll play Sunday in Jacksonville. "Every day," he said, "is all about progression." The Patriots may need that progression to get to the point to where Michel can play this weekend because if Burkhead can't go, then there will be an alarming lack of depth among Tom Brady's offensive weapons. At receiver, the Patriots have Chris Hogan, Phillip Dorsett and Cordarrelle Patterson. They also added Corey Coleman and Bennie Fowler on Tuesday. At tight end Rob Gronkowski and Dwayne Allen are available, but Jacob Hollister is dealing with a hamstring issue that kept him out of the season-opener and continues to limit him in practice. Burkhead's value to the Patriots extends beyond rushing the football (he had a team-high 64 yards on 18 carries in the opener), as he is also a capable pass-catcher. With a thin situation at wide receiver, the Patriots put Burkhead on the field with White at the same time for more than 10 snaps in Sunday's game. The team did add running back Kenneth Farrow to the practice squad Wednesday, releasing wide receiver Jace Billingsley. New England Patriots running back Jeremy Hill will miss the rest of the 2018 season after tearing his ACL in Sunday's game against the Houston Texans, per Ian Rapoport of NFL Network. After a 25-yard completion from Tom Brady to Rob Gronkowski was jarred loose, Hill was in pursuit to make the tackle. But Patriots fullback James Develin was blocked into the side of Hill's right knee. It buckled and he fell. Hill stayed on the turf for about two minutes before being helped to the sidelines. He didn't put any weight on the leg and immediately went to the sideline medical tent before being helped to the locker room. The team announced he wouldn't return for the rest of the game.Hill exited Sunday's tilt in the third quarter after taking a knee to the leg. He was immediately ruled out, signifying the extent of the damage. The 25-year-old looked to have a solid backup role in New England, earning 25 yards on four carries (6.3 YPA) and one catch for six yards on offense. He also blocked a punt on special teams. Jeremy Hill Jersey . Hill signed a one-year deal in New England this offseason to try and revitalize his career. Unfortunately, he'll be back to the drawing board after Sunday's devastating injury.This was Hill’s first regular season game for New England after spending the last four years in Cincinnati. He had four carries for 25 yards against the Texans before the injury. The Patriots are just days away from kicking off the 2018 season by hosting the Houston Texans at Gillette Stadium and now they have their captains that will lead them into battle on Sunday along with the rest of the season. White and Chung are the two newbies to this group as they are being named captains for the first time in their careers. Both of these two first-time captains take the place of Dont'a Hightower. It took a bit longer than most expected, but Rob Gronkowski finally finalized his reworked contract last Thursday. Speaking with reporters for the first time since his new deal was announced, Gronkowski said Tuesday he was glad the sides were able to reach an agreement before the start of the regular season. “It’s definitely a relief to have that all out of the way,” the New England Patriots tight end said. “That was last week, and now that’s in the past, which is good. I can put my main focus on the Houston Texans now.” The restructure will allow Gronkowski to earn an additional $4.3 million this season if he hits various production and play time benchmarks, boosting the max value of his contract to just north of $13 million. Gronkowski, who earned first-team All-Pro honors for the fourth time last season and is regarded as one of the NFL’s top offensive weapons, said seeing fellow stars like Aaron Donald and Julio Jones sign richer contracts hasn’t left him frustrated with his own situation. If it had, Gronkowski said, he would have considered holding out for a better deal, like Donald did in Los Angeles and Jones threatened to do in Atlanta. The New England Patriots had near perfect attendance for their first regular-season practice Sunday. Offensive tackle Trent Brown,who’s the biggest player on the roster at 6-foot-8, 380 pounds,was the lone absentee among players who made the Patriots' 53-man roster after Saturday's cuts. This is the first practice Brown has missed as a Patriot. He was spotted in the locker room earlier in the day, was the lone player absent for the media-access portion. Recently claimed wideouts Chad Hansen and Amara Darboh, acquired Sunday afternoon, were not present. Seventh-round rookie tight end Ryan Izzo was also not spotted, having reportedly been placed on injured reserve to make room for a second waived wideout to be added. The Patriots kept just seven offensive linemen on their initial active roster in Brown, offensive tackles Marcus Cannon and LaAdrian Waddle, guards Joe Thuney and Shaq Mason, center David Andrews and interior lineman Ted Karras. They plan to add another player, according to offensive line coach Dante Scarnecchia. Trent Brown Jersey . After initial stretching, rookie cornerback Duke Dawson was the only player to head off to a separate practice field for conditioning. Rookie running back Sony Michel took part in positional drills, as he continues to work his way back from a knee injury that erased his entire preseason. The Patriots had eight practice squad players on the field. They signed offensive linemen Cole Croston and James Ferentz, wide receiver Riley McCarron, running back Ralph Webb, cornerback Jomal Wiltz, defensive end Trent Harris, defensive tackle Vincent Valentine and quarterback Danny Etling. A source told NESN.com injured linebacker Harvey Langi is signing to the practice squad, but he wasn’t on the field. The Patriots will kick off their 2018 campaign against the Houston Texans next Sunday at 1 p.m. from Gillette Stadium. This is the final week of the preseason and for Julian Edelman, it is the last time he is allowed in the facility until Week 5,as he gets in his final work before serving a four-game suspension for violating the NFL's performance-enhancing substances policy. Starting on Saturday, September 1, Edelman will not allowed to participate in practice, play in games or be allowed at the team facility until the Patriots begin preparing for their Week 5 matchup with the Colts in early October. As the days are dwindling until that ban kicks in, the reality of his month long departure is settling in. Edelman added: “It is what it is. Real football starts soon. It’s definitely been a reality check, but I am not going to sit here and worry about things I can’t control. Ultimately, I put myself in this situation so it is more of let’s go and get myself ready for when I can play. Taking extra time to get my knee feeling great, getting my other ankle feeling great, this, that, everything because the NFL football season is a grind. That is what I am looking forward to.”Julian Edelman Jersey . While Edelman is certainly feeling the emotional tug of not being there with his teammates as they begin the year, he'll elect to use his time to continue to prepare for the 2018 season and be as healthy as possible once he does finally suit up in Week 5. With the Patriots releasing wide receivers Jordan Matthews, Malcolm Mitchell and Kenny Britt, it opens the door for Cordarrelle Patterson to seize a larger role in the first four games of the season when Julian Edelman serves an NFL suspension. When the Patriots traded for Cordarrelle Patterson this offseason, Bill Belichick indicated he may be used differently than he has been in the past, and through three preseason games it appears Belichick is right. Before coming to New England, Patterson was pretty much just a kick returner and a gadget player. Now with the Patriots, the 27-year-old appears to have more of a role as a receiver and has also added punt return duties to his resume. Friday night against the Panthers was a perfect example of his new role as he handled both the kick return and punt return duties for the first half until Cyrus Jones took over in the second half. He was also the Patriots’ most targeted receiver, catching five passes for 36 yards on nine targets. Given his speed and athleticism, it’s apparent he has the ability to make a play every time he touches the ball and the Patriots are doing what they can to make that happen.